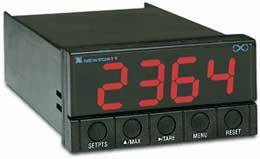 The Newport INFINITY® "C" series feature the biggest brightest display of any 1/8 DIN panel meter. The user can select the display colour to RED, AMBER, or GREEN. It can also be set to change automatically on an alarm condition. The unparalleled accuracy of the NEWPORT® Electronics INFINITY® signal conditioning is available in an economical series of Panel Meter/Controllers. The NEWPORT INFINITY® "C" series of meter/controllers feature a four digit display plus optional dual 5 amp Form C relays and a choice of isolated or non-isolated analogue output. The scalable 0-10 Vdc, 0-20mA, or 4-20 mA analogue output can be used as a retransmission of the display value or as a proportional control output as required. The microprocessor based INFINITY® "C" series includes instruments for Process (DC voltage and current) Strain Gauge/Bridge, Thermocouple, RTD, Dual/Differential Thermocouple, Dual/Differential RTD, pH, ORP. The INFINITY® C strain meter has a ratiometric input for use with load cells and bridge type pressure transducers. It also accepts a variety of DC voltage and current inputs to cover any typical process application. Standard features include easy front panel scaling to virtually any engineering units, selectable excitation of four voltages to work with most transducers and transmitters, front panel and remote tare function for weighing applications, and a hardware lockout to prevent unauthorized changes in setup. Four full digits and simplified scaling via the front-panel pushbuttons make it easy to set the display to read in any engineering units. Power: 115 Vac or 230 Vac ±10%; 50-60 Hz, 11.0 watts max. Power: 10-32 Vdc; 8.0 watts max. Bridge Input meter with no outputs.